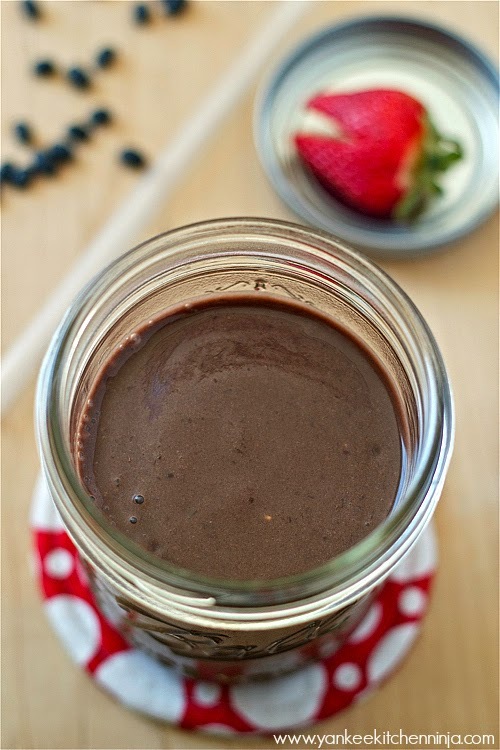 Attach a Mason jar to your blender to whip up this healthy chocolate-strawberry-black-bean smoothie -- dairy-free and naturally sweetened, it's the perfect good-for-you afternoon snack. 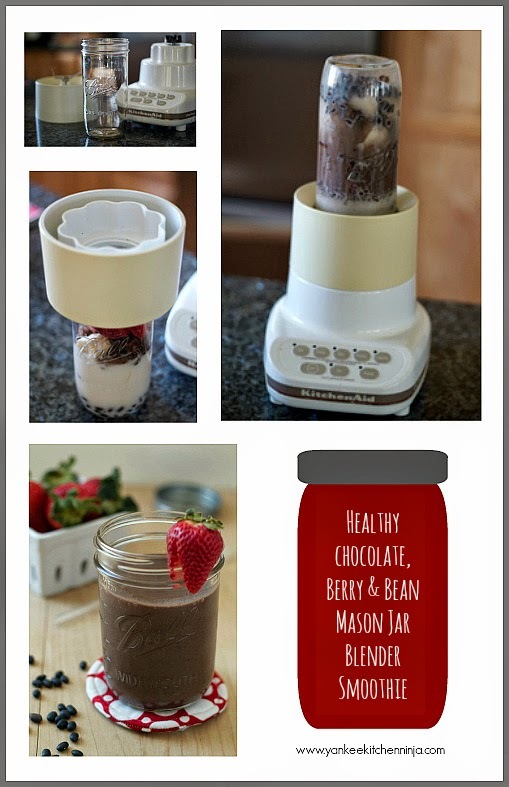 OMG, y'all: The Mason jar blender smoothie is not an urban myth! I still cannot quite believe that something crafty I saw on Pinterest actually worked. This is a smoothie game-changer for me. I love smoothies as much as the next person. I really do. Heck, I've got a bunch of smoothie recipes on this site. But I hate hate HATE to clean the blender. Did I say hate? I mean REALLY hate. Hand-washing is not my thing, so I don't make smoothies nearly as much as I'd like. I know, it's sadly, pathetically lazy but hey, we've all got our issues, right? If you separate the blade attachment thingy from the pitcher portion of your blender, you can screw the blade attachment thingy right onto a Mason jar! And then, after you whirl it up, you can drink it directly from the jar! Not even an extra glass to wash! ERMERGAHD: Lazy person's dream! I kid you not: I have photos. Now, please keep reading before you drop everything and go make a smoothie. THESE THREE THINGS ARE WICKED IMPORTANT! Be sure to use the correct size Mason jar for this little project. What I saw on Pinterest said it would only work with regular-sized jars, not wide-mouthed ones. Well, I'm here to tell you that THAT is a lie: It all depends on your blender. I have a KitchenAid and the only jars that the blade attachment thingy would fit inside were the wide-mouthed ones. So do a test on your own blender. Look CLOSELY at the blades of your attachment once it has been screwed into the Mason jar. I mean REALLY closely. You must make sure that no part of the blade is touching the glass. You know what will happen if the metal is touching the glass? IT WILL CUT INTO THE GLASS AND LEAVE TINY GLASS SHARDS IN YOUR SMOOTHIE (as well as destroy the jar). Let's not talk about how I know this is true, OK? But suffice it to say that Mr. Ninj has since filed away a teeny tiny bit of one of my blender blades. Use a jar big enough for the ingredients. I know that sounds obvious, but you want to ensure that there's enough headspace in the jar for proper whirling and mixing action to occur. For this recipe, which makes one large smoothie, I use a tall, wide-mouthed pint-and-a-half jar, even though the final product fits in one pint jar. I like me some wiggle room. OK, now that you've done your sizing tests, you're ready to get started with Mason jar blender smoothies. 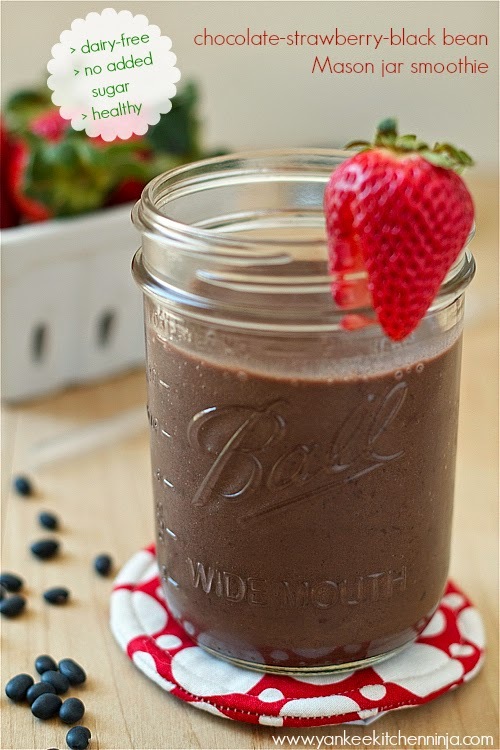 And how better than with a healthy, dairy-free, naturally sweetened chocolate strawberry smoothie amped up with ... wait for it ... black beans? This chocolate black bean smoothie was inspired by my chocolate black bean cookies, which are amazingly delicious (no one EVER suspects there are beans in them). If it works for a cookie, why not a smoothie? The sweetness in this chocolate black bean smoothie comes from dates. If you don't have any dates, you could also use honey. I've made it dairy-free by using almond milk (which is so easy to make! ), but another nut or coconut milk would be equally as yummy. Using frozen fruit eliminates the need for ice to make it nice and thick (I think ice in smoothies makes them too slushy), but if you use fresh fruit, you'll end up with a consistency more like a milkshake, which, frankly, may be more your thing. You make the call. Let's be clear: this is not a breakfast smoothie -- unless, of course, you normally eat chocolate for breakfast (if you do, we really need to talk -- that crappy behavior is just not helping you). I've become a fan of drinking this smoothie as a late-day snack when I'm craving a little something sweet. I love that I can get my sweet fix without ruining my appetite or my goal of eating healthy. I haven't tried it yet, but I am certain that adding a little espresso powder to the ingredient list would turn it into an amazingly mocha-y pick-me-up. You know what else? This smoothie recipe also makes amazing little popsicles! Yes! I just pour a bit of the leftover smoothie into an ice cube tray and stick a toothpick in each slot. Whenever you need a wee snack, pop one out of the tray for a chocolatey no-guilt treat. I'll stop squee-ing now and just get right to the recipe. Whip out those canning jars, peeps, and fire up the blender: It's smoothie time! Add all the ingredients to a Mason jar. Screw the jar onto the blade attachment of a blender and invert. Process until smooth and serve. How cute is THAT??? And how about for a party, everyone could make their own smoothie? LOVE IT! Now THAT is a genius idea! A make-your-own smoothie bar! You BRAT! ;-) No, just kidding. But you see where I'm coming from -- it's the no-dishwasher part that keeps me from using the blender more. But do try the black beans -- combined with cocoa powder, they are hugely chocolately and a lovely color! OMG! I have got to try this!